"Executive family home set on a premium ravine lot over looking lush forest & ravine!" Bedrooms: 7 "5 on the upper lvl, 2 in the lower lvl"
Bathrooms: 6 "1 half, 3 full on upper lvl & 2 full in basement "
Garage: Double, Attached "With convenient inside entry "
Executive family home set on a premium ravine lot over looking lush forest and ravine in the prestigious community of Credit Valley. Featuring pot lights and upgraded dark stained hardwood floors throughout the main living areas and oak stairs with wrought iron spindles. Open concept design with a combined living/dining room finished with coffered ceilings, main floor library complete with a French door and a sunlit family room highlighting a cozy gas fireplace with marble surround. The modernized kitchen offers dark cabinetry with upper crown moulding, pantry, Quartz counters, island with breakfast bar, backsplash, stainless steel appliances and servery, while the breakfast area offers garden door access to a large, 2-tier deck that overlooks luxurious forestry and ravine. The sunken main floor laundry room provides convenient inside entry to the double car garage. Tray ceilings, a large walk-in closet and spa like ensuite with his & her sinks, frameless glass shower & soaker tub completes the master ensuite while the additional 4 bedrooms share Jack & Jill privileges to two, 4-piece main baths with an upper level study loft. Enjoy the added living space in the professionally finished, walkout basement featuring a generous sized living room, pot lights, 2nd kitchen with stainless steel appliances, 2 additional bedrooms, two full upgraded baths and a 2nd laundry room. 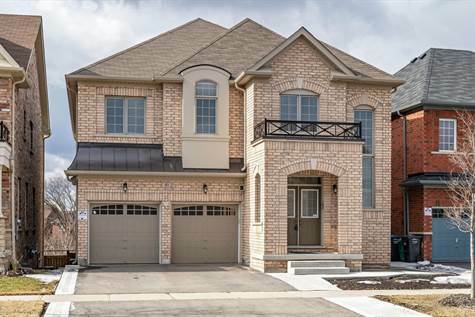 Ideally located in a quiet neighbourhood, close to schools, parks, shopping, HWY’s and more!